Monk’s Musical Advice… | Paul's Voyage of Discovery & Etc. And I’m glad he did. 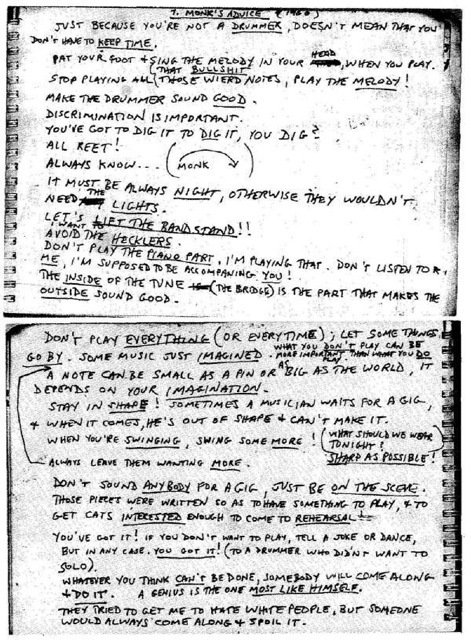 The photos capture two pages of notes on which jazz saxophone player Steve Lacy outlined the advice he got from the great jazz man, Thelonious Monk. Lacy played with Monk in the late 50’s and early 60’s. The notes speak for themselves. It’s impossible to imagine more perfectly profound musical wisdom crammed into two small pages. If you’re intrigued by Steve Lacy’s notes on Monk’s musical advice, check out this great blog article for more information on this wonderful document. Isn’t that pretty much what we all implied with our standard PTC note, “more good”?